You may believe that summer is the most expensive time to travel, and in many cases, you’re right: Europe fares double over winter and spring rates and stratospheric gas prices make U.S. road trips a pricey proposition. But luckily, it’s not high season everywhere, and if you know where to go, you can avoid high travel prices and crowds on your vacation. By keeping track of travel trends and using data from our archives, we found five popular destinations that are off-peak and more affordable in the summer than other times of the year. In the summaries below, read how you can save on summer travel to each spot and find tips for locating other off-peak rates and deals. The time frames for the low season vary by destinations and may be defined differently by individual hotels and airlines, so to be sure to check with each provider before booking. Our top five choices for off-peak summer travel this year include one far-flung destination, Sydney, Australia; one close-to-home choice, Colorado mountain resorts; and three tropical hot spots, Costa Rica, Puerto Rico, and Mexico. Situated “down under” the equator, Sydney and the rest of Australia experience cooler winter weather between June and September, causing a drop in tourismÃ?Â?and airfare prices. With temperatures averaging between 40 and 70 degrees, the season is still a pleasant time to enjoy the city and its surrounding regions. Some of the city’s heaviest precipitation falls during the month of June, but July through September are among the driest months of the year. Though the weather may not be perfect, this season can be the most attractive to budget-conscious travelers because of the chance to save on big-ticket Australia fares. Regularly costing over $1,000 for round-trip travel from January to March, fares between Los Angeles and Sydney can fall as low as $598 round-trip for travel through late May. Not all sale fares will be this cheap, but we do expect that you can save at least several hundred dollars by traveling in the off-peak months. To get a general idea of the price differences you can expect between peak and off-peak travel to Sydney, we looked in our archives and found sample sale fares (on United) for travel this past winter. We then compared prices with current sale fares for flights this August (on Qantas). We found that sale fares for summer travel were around $200 to $300 less than the winter sale fares. Winter fares on United are based on travel between January 15 and March 31, 2004, and were researched by SmarterTravel.com staff for a deal published January 15, 2004. Summer fares on Qantas are based on travel between August 4 and 18 and located on the Qantas website during a search conducted May 11. The fares listed above do not include taxes and fees. To find current Australia air deals, check the SmarterTravel.com air page along with websites of the carriers that frequently offer Australia sales, such as Qantas and Air New Zealand. Expect to find seasonal deals to other destinations in Australia and New Zealand as well. For air-and-hotel packages, check out the specials listed on the Australian Tourist Commission’s website where you can find vacations including round-trip airfare and four nights each in Sydney and Melbourne from $1,299, not including taxes and fees. Glitzy Colorado resort towns like Aspen and Vail, that feature high-mountain skiing and even higher prices in winter, bring their rates back down to earth for the beautiful, but less popular summer recreation season. In the summer, these resort towns offer access to fine dining and shops, breathtaking mountain scenery, and activities such as hiking, biking, and fishingÃ?Â?many of which are free. Temperatures tend to range from 40 to 80 degrees (varing by elevation), and sunny days with afternoon thunderstorms are common. Hotels, condos, and vacation rentals that charge top dollar during ski season may lower rates by 50 percent or more to attract outdoor enthusiasts or those looking for a relaxing mountain retreat. To demonstrate the difference in pricing between peak ski season rates and off-peak summer rates, we researched seasonal room rates at hotels and resorts in Aspen. These prices are based on the per-day double occupancy rates posted on the hotels’ websites and do not include taxes. Rates vary by date and may be higher for stays over holidays. Visit Colorado.com to learn more about summer vacations in Colorado resort towns and to find hotel listings and travel deals. While seasonal airfare variation is minimal, you can take advantage of low fares from the many budget airlines that fly to Denver including AirTran, ATA, America West, Frontier, JetBlue, Midwest, and Spirit. Keep track of domestic sales on these airlines in the SmarterTravel.com air section. In exchange for putting up with a little wet weather during Costa Rica’s summer “green season,” travelers can reap the savings with low-season accommodations rates and discounted airfare and vacation packages. Costa Rica does not experience major temperature variations (the average temperature is 62 inland and 89 degrees on the coast, according to the Costa Rica Tourism Board), but rainfall is more common during the summer months than the rest of the year. Data from our archives indicates that in past years it was possible to find affordable sale fares to Costa Rica during the summer and the winter, with low fares hovering around $300 round-trip. However, for travel through this June, we’re finding some of the lowest Costa Rica fares we’ve ever seen, for example, with round-trip fares from Miami to San Jose, Costa Rica, starting at $146 on Iberia, not including taxes and fees. Visit our air page to find other Latin and Central America sale fares. These prices are based on the per-day double occupancy rates posted on the hotels’ websites and do not include taxes. Rates for the Lapa Rios are all-inclusive and based on two people staying in the same room. Rates vary by date and may be higher for stays over holidays. To find Costa Rica hotel listings and specials, go to VisitCostaRica.com. For affordable air-and-hotel packages, check the websites of vacation providers that frequently have discounted Costa Rica packages including Gate1Travel, Go-Today, and Jet-A-Way Holidays. Cautious travelers wary of tropical storms and hurricanes tend to avoid Puerto Rico and the rest of the Caribbean in summer, driving down prices, particularly for accommodations. However, while the National Oceanic and Atmospheric Association (NOAA) lists the Atlantic’s hurricane season as running from June 1 to November 30, it notes that the vast majority of storms occur between August and October. Thus, it’s still possible to enjoy off-peak rates with a low risk of encountering a storm in the early summer. If that’s a wager you’re willing to make, it’s possible to save hundreds on room rates by visiting the island during its off-peak season between May and the December holidays. To demonstrate the possible savings, we compared off-peak and peak rates at several Puerto Rico hotels. Visit the tourism website for Puerto Rico to find accommodations and specials on the island. The website is currently running a low-season hotel promotion that promises free nights, breakfasts, and more. Although the airlines tend to run Puerto Rico sales throughout the year, two recent developments may help drive air prices down this summer. First, the budget carrier JetBlue has added several Puerto Rico routes to its repertoire, with its newest route between New York (JFK) and Aguadilla, PR, starting up May 27. Sale fares from New York to Aguadilla or San Juan, PR, for travel through June start at only $198 round-trip, not including taxes and fees. Second, another budget carrier, ATA, announced that it will add service from Orlando and Tampa to San Juan beginning June 1. You can keep abreast of Puerto Rico sales from these and other airlines on our air page. According to the American Society of Travel Agents (ASTA), Cancun is the number two international destination booked by U.S. travelers after London. To avoid the highest rates in this much sought-after hot spot, visit during the early summer monthsÃ?Â?after the spring breakers depart. Not only will you save money, but you’ll avoid the worst crowds of the year as well as peak hurricane season, which hits towards the fall. While tropical storms are a possibility in the summer, storms are less of a factor in Cancun than they are in the Caribbean islands. Given Cancun’s popularity, it’s no surprise that you can find air sales for travel to the region throughout the year. However, rates for accommodations take a noticeable dive, particularly between late April and July, before Mexican and European vacationers tend to arrive. We compared rates for peak stays (between the December holidays and April), with off-peak stays at all-inclusive resorts in Cancun, and found major price differences. 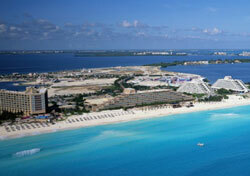 Visit the website for the Mexico Tourist Board to find listings of Cancun hotels and resorts. This site does not include web links, so you’ll have enter the hotel name into a search engine like Google to locate its web address. If you’d prefer the ease of an air-and-hotel package, check our vacation page for the latest Cancun deals. This feature is the second installment of our 2004 off-peak travel series which began with the top five off-peak destinations for spring. You can expect future articles on off-season travel for the fall and winter seasons. For general low-peak travel planning strategies, read our feature Low season, low cost: Five tips for off-peak travel.